Continuing this series of African Indigenous Spirituality has been at the forefront of my mind and it’s been driving me crazy that I hadn’t yet published the next installment. So, here we are, picking up where we left off with Ancient Egypt. If for some reason you landed on this blog for the first time by way of this post, and you have not yet read parts 1 & 2, you can do that HERE & HERE. Egyptian, meaning The Black Land, is often referred to as The Temple of the World. Indeed many cultures of the world have “borrowed” ancient Egyptian ways and rituals as a way to reach gods and also to achieve spiritual enlightenment. Life IS magick as far as I am concerned, and the practice of it should be a regular part of any person’s life. Using magick in everyday life is how one develops into a true magickal being. It seems like the instincts of the ancients were en pointe in that regard. No aspect of ancient Egyptian life was untouched by magick. As early as the Predynastic Period in Egypt (c. 6000 – c. 3150 BCE) and appearing in inscriptions in the Early Dynastic Period (c. 3150 – 2613 BCE), the Egyptian word for magic was “Heka”, which literally means “using the Ka”. Heka referred to the deity, the concept, and the practice of magic. Heka was pretty much the personification of magic. For the ancients this magick permeated everything in creation, therefore all things in creation possess heka to a certain degree. 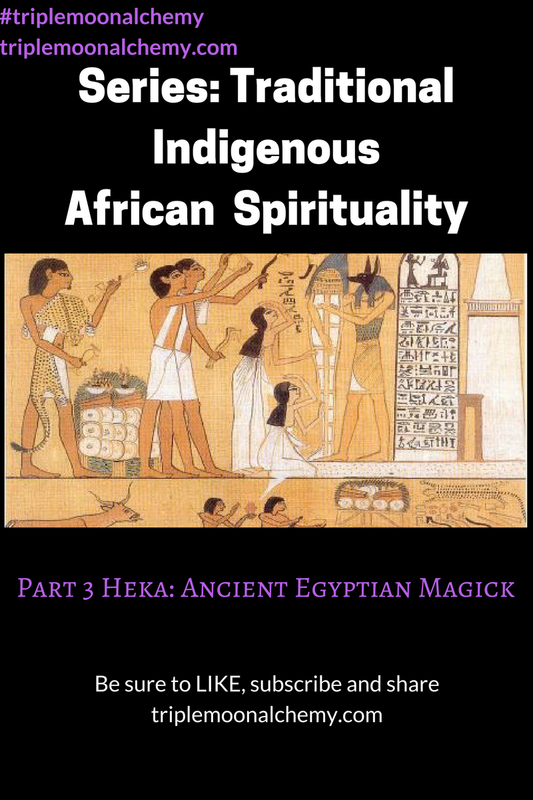 As deity, Heka is the god of magic and medicine in ancient Egypt. He was depicted in anthropomorphic form as a man in royal dress wearing the regal curved beard of the gods and carrying a staff entwined with two serpents. The Pyramid Texts and the Coffin Texts both claim Heka as their authority as the god whose power makes the texts true. He was referred to as Lord of the Ka’s. The ka is one of the principle aspects of the soul of a human being or of a god. Heka is therefore originally the deity who watched over one’s soul, gave one’s soul power + energy, and allowed it to be elevated in death to the afterlife. I can see how many cultural religious practices pattern themselves after ancient Egypt’s ways, and so have many of our more popular magickal paths. For instance, heka was linked with the creative aspects of the heart and the tongue. It was thought then, (and I can see this belief played out in several occult paths), that the tongue gave expression and animation to one’s thoughts, feelings, and personality. Heka was the power that infused both sia and hu, which are the personifications of the heart and of the tongue. Likewise, any practitioner of the Craft knows that in order to get things moving in the realm of the unseen, our intentions (sia) are the building blocks, and speaking (hu) those intentions in the form of incantations, is the fire needed to raise the energy and manifest (heka) those intentions. This is sia, hu, and heka at work. Doctors and others who practiced medicine in ancient Egypt and called on heka to perform their work, were known as priests of heka. The majority of people in today’s society don’t think of our doctors as priests, or having any relation at all with spiritual things. For ancient Egypt though, to be a doctor was to be a healer, in the truest sense. To them, medicine was better and more effective with magic, and magic was better or more effective with medicine when it came to healing. I 100% believe that also, which is why I created the magickal apothecary. I have believed in the power of magickal herbal healing for a long time. I digress…Disease to ancient Egyptians was thought to come from the gods, or an angry spirit or evil demon, therefore supernatural power was needed in addition to earthly powers like herbs and other minerals. Doctors or priests of heka would call on heka to cure whatever disease was present. This was not anything to be taken lightly, as these priests/doctors possessed great power. Great power were also possessed by Seer’s and Wise Women, those who were not doctors, performed magickal healing as well and were an integral part of society. These wise women could interpret dreams, help women conceive, prescribe herbal remedies for ailments and disease. Which is by the way, the cloth that I seem to be cut from! Egyptians of every social class from the king to the peasant believed in and relied upon magic in their daily lives. They used amulets, spells, charms, and incantations for any aspect of life that they felt. All of these such practices sound very familiar to me. Do they to you? Ancient Egyptians used inscriptions above or beside a door as amulets, they hung vegetables like onions to ward off evil spirits, they would recite a certain incantation or spell before starting on a journey. All of these were invoking the power of Heka no matter what other deity was called on. Perhaps ancient Egypt was the birthplace of animism as we have come to know it throughout recorded history. Whew! Obviously the ancient Egyptians built the blueprint for many many occult practices and religious practices that exist today. I am excited to ride this wave through history and journey on to see exactly how ancient Egypt effected the many areas of Africa and what came to be indigenous spiritual practices of Africa. It appears that heka is the primordial unseen force. The First Magick. The model of the world as ancient kemites understood it contained magic as an essential element. All of life had come from the gods and these gods were not distant beings but friends and allies who inhabited not only the temple in the city, but the trees by the stream, and the river which gave life. I don’t know about you, but this is very closely related to how I see and use magick. Thank you for reading. I hope that this was worth the wait and that the info was enlightening. I look forward to the next installment. It shouldn’t take as long as this one did to be published [insert smile]. If you have yet to subscribe, you can do so on the homepage at the top of the page, better yet, you may do so right HERE. Subscribing puts you ahead of the game!. You get notified when a new post is published so you won’t miss out on the next installment of this series. Also, feel free to share this or any of the posts on this blog on your Facebook, Twitter, Instagram, Tumblr, group chats, whatever. If you are in any FB witchy groups, share it there also, we learn and grow from one another! Until next time. Blessed be. Ashe!